Since I‘m under the weather today I decided to skip the extra lunch preparations today and streamline dinner. I had planned on doing lasagna, which requires a lot of preparation. Instead, we’re trying our first grass-fed beef roast which I ordered from U.S. Wellness Meats last week. 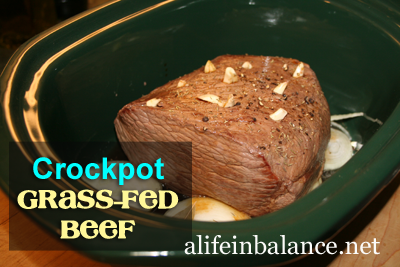 Word is these roasts do well with a long slow moist cooking method. 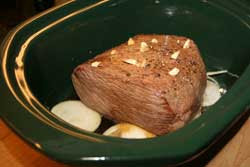 After consulting various cooking references, I decided to cook the roast in the crock pot. All I had to do was brown the meat, prep a few veggies, and throw everything in a crockpot with salt, pepper, thyme, chicken stock (already open in the fridge) and soy sauce. Super simple for a day like today. Being terribly English, I did decide to make Yorkshire pudding. However, since I’m trying to get into the habit of soaking grains before using them, this last minute decision was a bit problematic. So…I mixed up the white whole flour with a cup of buttermilk, with the buttermilk replacing the milk called for in the recipe. The flour will soak until later today when I finish making the batter. It’s not the 12 to 24 hours that Nourishing Traditions recommends, but if this doesn’t work, at least I tried. Brown the meat in a large frying pan with bacon fat. Put the meat, onion, an carrots in a crockpot with salt, pepper, thyme, chicken stock, and soy sauce.